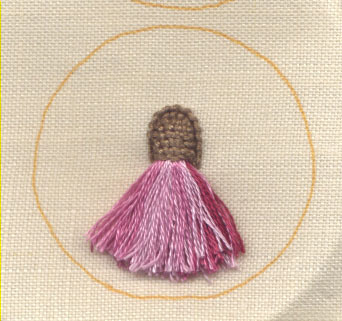 Here’s my little effort for this months Ornament Stitch A Long. 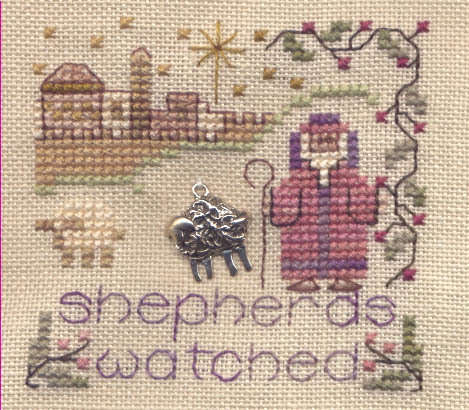 This is Shepherds Watched by Shepherds Bush from the 2002 issue of Just Cross Stitch Christmas Ornaments. Stitched with all the called for threads on a piece of anonymous 32 count fabric from my stash. I’m very pleased to have done this piece. 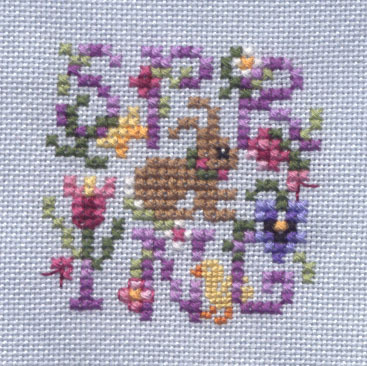 It feels like ages since I did any Shepherds Bush stitching and they are one of my favourite designers. A pinkeep from The Netherlands. 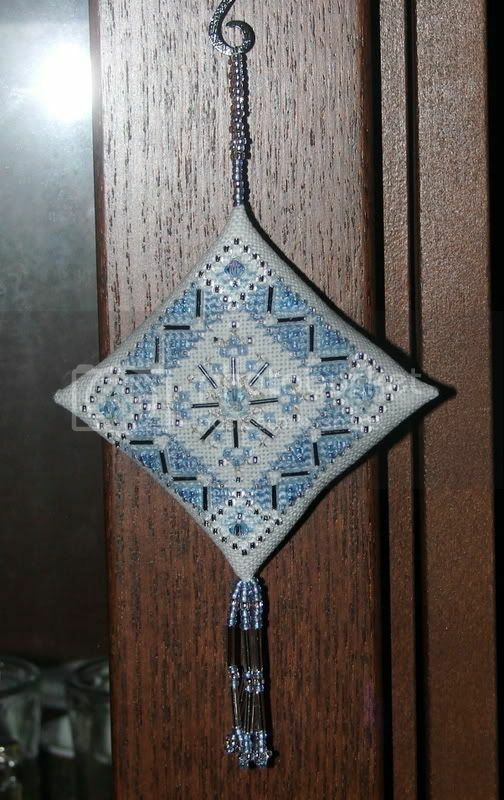 Here is a scan of the lovely pin-keep Judith sent to me for our Trip around the World Exchange which was hosted on the Stitching Blogger’s Exchange Board. You can see a photo with the card Judith sent here. I posted a scan so you can see the stitching better. Judith did a beautiful job! Many thanks, Judith! My stitching for this exchange is on it’s way to it’s secret destination. I posted it on Friday – one day before the cut-off date (just had a bit of difficulty getting to the post office this week). I’ve had a wonderful day today, first up I had a facial at my beautician along with a pedicure and massage (ahhhh lovely!) Followed by lunch at the Duckstein Brewery with Joel, I had a cheese kranskey sausage with sauerkraut and fried potatoes. Joel had an enormous mixed grill. Understandably we had a little nap when we got home. 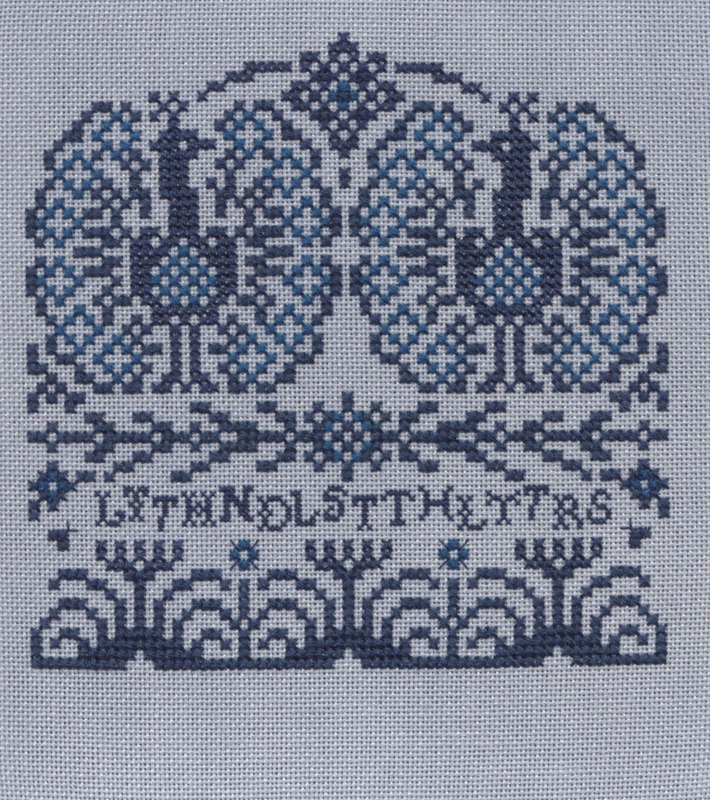 Tonight I have been working on Peacock Cypher (Just Nan) and have finished section one (of four) – yay me! Just a reminder – it’s stitched with AVAS silks on Moonbeam 28ct Jobelan from Stitches and Spice. I can’t believe I forgot to say what it was I learned at my craft circle session at the fair – I learned how to stitch needle-lace (the nut of the gum blossom). The flower part is just a really tiny tassel (I wrapped the floss around one of my fingers) shoved (and I mean shoved) up inside the needle-lace and secured. Cathy learns a new skill! I went to the Perth Craft and Quilt Fair today and had a fabulous time! I really wanted to attend the Country Bumpkin class in the craft circle and was really pleased there was room for me when I got to their booth. So here is the product of my hour’s labour – a little gum blossom. Isn’t it cool! For my friends in Perth, I really recommend this class, Maree is a very patient teacher and the project is really quite easy. The finishing for this project is as a scissor fob. It’s going to be so cute when I get around to doing the finishing. The Embroiderer’s Guild of Western Australia had a wonderful exhibition at the show that was very inspiring. The Quilt Exhibit was just gorgeous as well. And yes, I found plenty of things to spend money on at the shops exhibiting at the fair. Here is Spring Spell, the latest Just Nan limited edition Wimzi which I stitched on Monday in my valiant attempts to break the stitching drought. I’ve not yet mounted it in it’s cute wimzi frame because I can’t find my interfacing (the stitching room is in a state yet again)! Now that I look at it again I can see I’ve left off two stitches (duckie’s eye and the “trumpet” of the daffodil) so really it is a good thing I couldn’t find it on Monday evening. Stitched on a scrap of hand-dyed blue fabric from Stitches and Spice. And what did I stitch on the weekend? 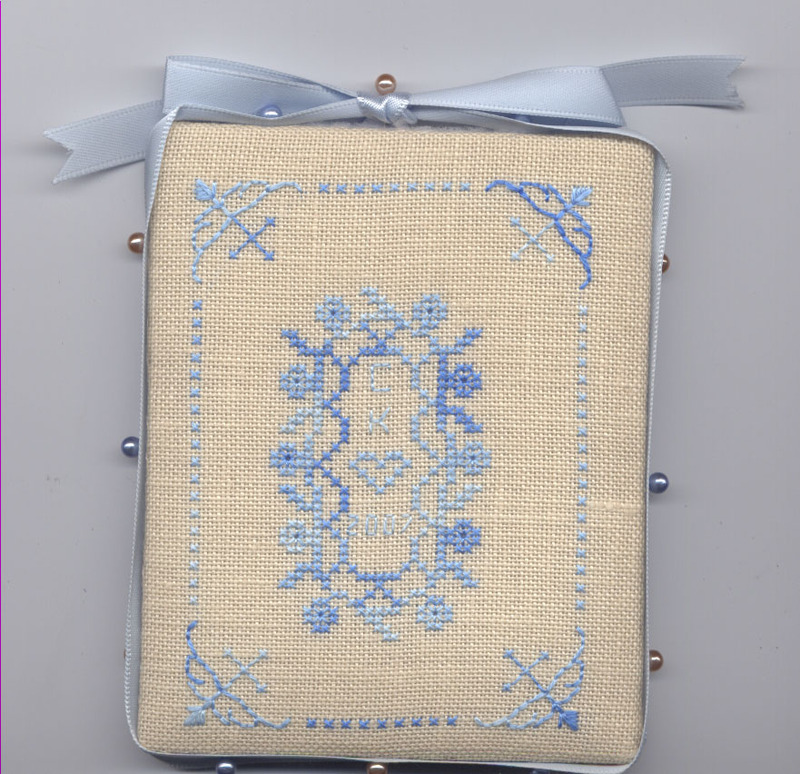 I pulled out another Tiny Treasured Diamond Kit by Mill Hill (these kits can stitch up really quick and are beautiful when completed – a great slump fix). This one is Blue Velvet Diamond. It’s a horrid photo, I’m afraid you will just have to take my word on it’s splendor. I went back to work yesterday and it wasn’t as bad as I had been building it up to be (I’m a great dramatist). As I said to Joel – I even caught myself enjoying it a couple of times. Two more work days and then I am done with one employer and then start full time with another. My new job with the State library is very different from what I have done in my previous work life but I am looking forward to it very much. And in personal milestone news, Joel and I celebrated our third wedding anniversary yesterday. Since some of my other May bride blog friends have shown their pictures I thought I’d give you a peek at our big day. As you can see it was a bit overcast and windy (but we didn’t care). It’s autumn now here in Western Australia. My favourite season. My dress had a black underskirt with a delicate white flower “lace” layered over it, which was also mirrored in the bodice. I remember when we saw it in the shop, I laughed that anyone would buy a black wedding dress, but when I had it on, the decision was made! It is sleeveless but I have a wrap on because it was very chilly by the time this photo was taken. We were married at the Sunken Garden at UWA and this picture is from down the road, just over the road from the Old Swan Brewery for those of you who live in Perth or know it. 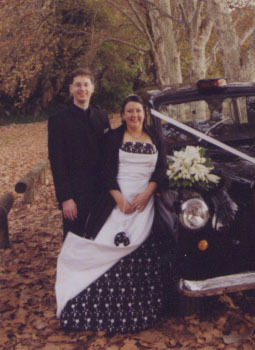 We had an old London cab as our wedding car for the big day. Ah, memories. To celebrate, Joel and I went out for tea (just Nandos, we are going to the Duckstein Brewery to do it properly on the weekend) and the walked down the street to Planet Books which is a late night bookshop and bought ourselves a couple of books. It was for me, a perfect way to celebrate our happiest day. Confession: The last time I picked up my needle and stitched in a serious way was Tuesday. It’s been a bit of an unsettled time for me. I just can’t seem to sit still. Every time I try to settle down to stitch I want to leap up and vacuum (I know, I know) or clean the fridge or do some other boring household task. New stash is not helping (and I know the restorative powers of new stash!). Instead I’m kind of overwhelmed by all I have. And funnily enough, I still want more. This has been the last week of my Long Service Leave – I have had three glorious months off work. 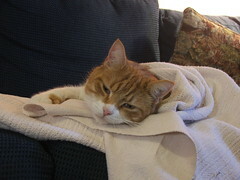 I think that the thought of returning to work has put me into this little funk. Actually, I think I have become bored – I need to work – I need to have the challenge of work and the reward of knowing my work is done well. Right, it’s time to stop moping and pick up a quick little stitch, I’m going to pick up an ornament kit and start stitching again. Maybe I’ll have a finish to share with you all soon.